Xerox DocuMate 4440 is a color duplex document scanner with 50 sheets automatic document feeder (ADF). It provides one-touch scanning of 9 predefined and customizable scanning profiles, either from your computer or the scanner itself. The 4400 has a 12-by-7-inch footprint (WD), and weighs 8 pounds. It has a straight paper path, allowing it to scan business cards and identification cards and other 1.3 mm thick plastic cards, even though it does not include a business card program. It can also scan paper up to 8.5 x 38 inches. It offers ultrasonic double-feed detection sensors to capture paper use errors. 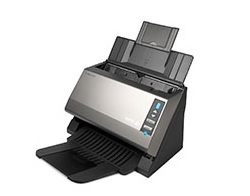 Like most document scanners, the 4440 can scan up to 600 dpi. You can choose (or adjust) one of nine Visioneer OneTouch scanner profiles. To the right of the ADF is a single character blue LED used to display the current number of scanning profiles, which you can change between up and down arrows. To start scanning from the scanner, you press the Simplex or Duplex button. Default OneTouch scanning profiles and goals include Scan (PDF image); PDF (searched PDF); Print (BMP); E-mail (PDF); Fax (BMP); OCR (RTF); Archive (searchable PDF, 300 dpi); Business Card (BMP); and Paint (BMP). It can scan to PDF, PDF, JPEG, TIFF, and searchable BMP format; it can also scan to RTF and other document formats if you install PaperPort or OmniPage Pro are included. Download the Xerox DocuMate 4440 scanner driver according to the Operating System on your PC or laptop at the link below.